If you are using medication or supplements then it is very likely that you are taking magnesium stearate on board. In fact, it is so widely used by manufacturers it is extremely unlikely that you have avoided it. But is this a problem? The short answer is that it might be. It is certainly controversial and it has been central to a heated debate for a very long time but as things stand at the time of writing, nothing is concrete. Like most other supplements or chemicals, magnesium stearate is doubtless not such a great thing in extremely high doses but it may well be far less harmful than its reputation when taken in the very small doses that most of us are likely to come across. What exactly is Magnesium Stearate? Essentially, magnesium stearate is a compound which contains magnesium a well as 2 stearic acids. Stearic acid is actually a saturated type of fatty acid which is found in a variety of different foods including both vegetable and animal fats. Examples of food with very high levels of stearic acid are flaxseeds, cocoa butter and beef. Once magnesium stearate has broken down into its original components, the fat it contains is effectively identical to stearic acid fat. In fact, there are several reports that the magnesium part of magnesium stearate is actually able to provide the body with this very important mineral. Given that magnesium deficiency is such a widespread problem, it is possible according to some experts that magnesium stearate may even be beneficial to the body. However, there is limited research based evidence to prove this theory entirely. The reason why magnesium stearate is used so much in pharmaceutical production is that it has excellent lubrication qualities. It is known as an outstanding ‘flow agent’ which helps manufacturers speed up the production process because it can prevent the ingredients from attaching itself or sticking to mechanical equipment. Only a very small quantity is required in order to coat drugs or supplement powder mixtures effectively. 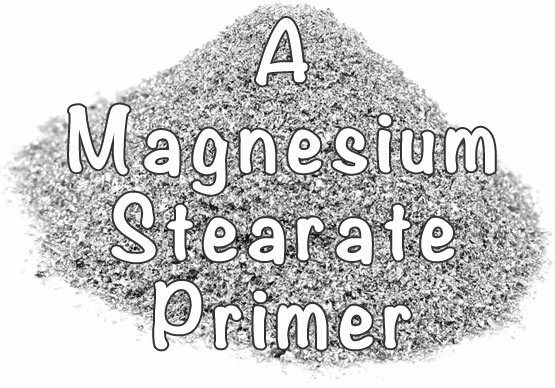 As well as being used to prevent machinery from sticking, magnesium stearate is also helpful in the swallowing process. It actually helps you to swallow the pill more easily and to make its way through the gastrointestinal tract more comfortably. Magnesium stearate also has excipient uses. This essentially means that it can actually help enhance the medicinal effects of whatever active ingredient the drugs contain by improving both drug solubility and absorption. Alternative excipients to magnesium stearate are possible but as yet it’s unclear whether they are necessary or not. 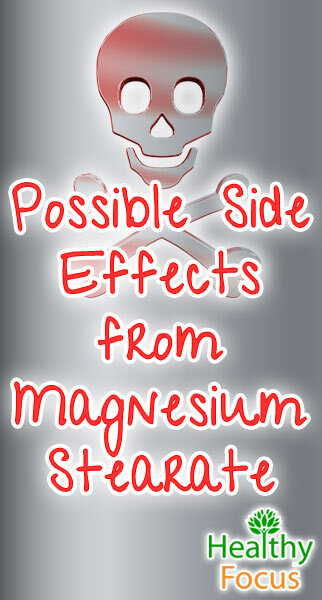 The reports on the safety of magnesium stearate are conflicting to say the least. Many experts are quite certain that it is not toxic while other reports claim that it is most definitely toxic and although severe side effects are rare, they are nevertheless real. Most experts seem to agree that while taking huge doses cannot be good for you, the very tiny amounts that we generally consume are not as bad as some of the reports and articles would indicate. The National Institute of Health produced a report on the effects of magnesium stearate states that there is a rare chance of magnesium overdose which can hinder neuromuscular transmission and cause poor reflexes and weakness. In spite of this report, it is clear that minds have not been put at ease; it will not take much work to find a plethora of potential side effects from a quick search on the web. It is often stated that magnesium stearate can hinder the immune system because of its action on the body’s T cells. However the evidence for this effect is very weak and largely comes down to a single study conducted in 1990. The scientists isolated the T cells of mice and then bathed them with a solution that contained stearic acid. Researchers saw that the T cells absorbed stearic acid into the cell membranes before eventually killing the cells. There are several problems with using this study as evidence of the effect of magnesium stearate. The study did not use magnesium stearate; instead it uses stearic acid of the type found in chocolate and cocoa butter. The implication here is that any concerns about this study could be passed onto foods which contain far more stearic acid than your pills and supplements. The study itself proves very little in terms of dietary consumption. Your T cells are not going to be soaked with stearic acid any time soon. A study conducted by Japanese researchers in 2009 which set out to evaluate several commonly used excipients discovered that magnesium stearate could cause formaldehyde to occur. (6) But before you get overly worried, it is worth pointing out that formaldehyde occurs naturally in many food products including fruit and vegetables. And what is more, magnesium stearate was the least culpable of all the excipients that were tested producing only 0.3 nanograms of formaldehyde to each gram. This really is a tiny amount of formaldehyde and is nothing to be concerned about especially when you compare it to the 400 or more milligrams of formaldehyde produced from eating a shitake mushroom. There is some concern that magnesium stearate may be contaminated by pesticides since it is sometimes sourced from cotton seed oil. It is however highly refined and purified before being added to any supplements. There are no reliable reports which indicate magnesium stearate has any significant quantities of pesticides. A study conducted in 2012 reported on the case of a young woman who suffered an allergic reaction from magnesium stearate. The reaction caused the woman to suffer from hives. There are incredibly few reports of allergies and it is impossible to find the full text of the report regarding the woman. According to most experts an allergy to magnesium and stearate is very unlikely to occur. Of course, if you do develop a reaction, you should stop taking it until you are sure. There is very little evidence that magnesium stearate id a real cause for concern especially in the very small does that we consume it.